The EU institutions reached a political agreement today (12 November) on both the Union's budget for 2014 and pending amending budgets for 2013. Both the European Parliament and Council must still formally adopt the agreement. The European Commission announced the agreement at 4am this morning. Negotiators reached a deal of €142.6 billion for total commitments and €135.5 billion in payments (see background) for 2014. Reportedly UK, the Netherlands, Denmark and Finland have voted against. The vote requires qualified majority, not unanimity. The deal also includes an agreement on various pending amending budgets for 2013 (draft amending budgets 8 and 9, respectively, with €3.9 billion to pay claims for funds such as Cohesion Policy and €400 million to compensate regions affected by heavy floods last spring). The Commission's original proposal for the 2014 budget amounted to €142.6 billion in commitments and €136.1 billion in payments. The Council's position on the 2014 budget was €142.2 billion in commitments and €135 billion in payments. The European Parliament's proposal stood at €143.1 billion in commitments and €136.4 billion. The agreement surprisingly is 500 million higher than the Council proposal. The reason is that the Commission has accumulated a lot of bills that need to be paid. 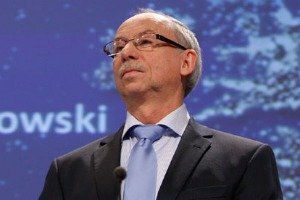 "After over 16 hours of negotiations we have reached an agreement on the EU budget for 2014," Budget Commissioner Janusz Lewandowski said. According to the commissioner, the deal reached between the European Parliament and the Council provides much needed investment opportunities for Europe's businesses, scientists, towns, regions and students. “I can only commend the European Parliament, the Lithuanian Presidency of the Council and behind it Europe's Member States for the spirit of cooperation that prevailed throughout this negotiating process as well as for the compromises that they have been willing to make in order not to fail all those across Europe who await EU funding,” Lewandowski said. The Commissioner added that the agreement also constituted a crucial step in the direction of the adoption of the next long-term budget for the Union, the Multi-annual Financial Framework for 2014-2020. Several agencies, such as Frontex, Europol or EASO, the European Asylum support office, will see their budget increased, apparently in the context of the recent tragedy in Lampedusa. Also, the new agencies such as ESMA, the European Securities and Markets Authority and the European system of financial supervisors and the European Banking Authority will get additional funding. Also, institutions have agreed to front-load the financing for Erasmus, COSME, the EU programme for the Competitiveness of Enterprises and Small and Medium-sized Enterprises, and for science programs. Cyprus will receive an additional 90 million, which is the 2014 tranche of a payment of 200 million decided by the Council in addition to their financial envelope under the 2014-2020 budget. Conversely, the Council rejected a budget increase of 300 million to top up salaries of officials according to inflation indexation. The Council’s position has been not to provide for this amount until the Court of Justice of the EU in Luxembourg would rule on the matter. Speaking to EURACTIV, MEP Ivailo Kalfin (Bulgaria), the S&D's representative in trilogue budget talks, said that the Parliament is satisfied that by adopting the 2014 budget, the institutions have made possible the implementation of the 2014-2020 budget from 1 January 2014. He also said that he was satisfied by the institution’s commitment not to stop or delay the implementation of project due to financial reasons. Anne Jensen, Danish MEP of the liberal ALDE group and 2014 budget rapporteur in Parliament, says the outcome is “an austerity budget”. “But I am glad we managed to secure more funds for growth policies for research, education and innovation and for humanitarian aid in the Middle East”, she added. Richard Ashworth, leader of Britain's Conservative MEPs, said: "While we voted against additions to the budget, we welcome the overall direction, which is an effective freeze of EU budget. Alongside the historic 3.8% reduction which we have secured on the EU's long-term budget, this as further evidence of us bringing genuine discipline to EU spending. Our drive to bring down costs in Europe is continuing to bring results. It is particularly welcome that money has been switched away from less-useful budget headings to the important areas of research and development, education, training and jobs." Portuguese member for the leftist GUE/NGL group and budgets coordinator Alda Sousa said that "instead of being a budget for an enlarged, 28 member state EU with greater competences all we see are cuts with next year’s budget cut by 7% compared to 2013. Structural funds will be again reduced so that room can be made for the European Fund for the Most Deprived People - still these resources will be taken from the European Social Fund. How can we see such a lack of resources in what is still one of the richest continents of the planet?" At a summit on 8 February, EU leaders reached agreement on a €960 billion long-term budget for 2014-2020, representing the first net reduction to the EU budget in history. On 27 June, hours before the beginning of the EU summit, the three institutional top officials announced what appears to be a final compromise. Lawmakers have approved a compromise struck on 4 July on the multi-annual financial framework (MFF), the EU's budget for 2014-2020. The European Parliament and the EU Council are currently entangled in a dispute over the budget for 2014. The European Parliament still has to hold a final vote on the long-term budget for 2014-2020, the MFF, on which a deal was struck over the summer. The EU budget for the financial year 2014 will be the first annual budget under the new MFF 2014-2020.